I really liked Ruin And Rising! More than I expected, but also not as much as I was hoping. Still, I think it’s my favorite book in the series. Which is weird, because I LOVED Siege And Storm, and only really liked Ruin And Rising, and yet, this one is still my favorite. I think it’s because everything really comes together in this book. There are definitely some big revelations, with the third amplifier being the main source of these revelations. So much comes from it, and I feel like I can’t talk about the book without giving things away. 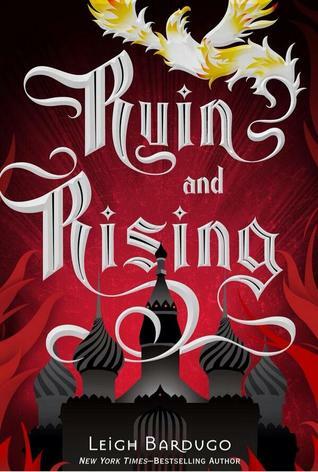 This is where things get very spoiler-ey, so if you haven’t yet finished Ruin And Rising and care about spoilers, you might want to skip ahead to the big note signalling the end of the really spoiler-y part of the review. (Or even to the rating, which will be the very bottom of the review). So: we learn about Morozova, and his connection to both Baghra and the Darkling…his daughter, and his grandson, respectively. I wasn’t expecting that at all, so it was quite the surprise. It worked, and yet I didn’t completely love it, because it felt a little too forced and random. And as it turns out, Mal is the third amplifier! Somehow, Mal ended up being the third amplifier, and I don’t remember why! I don’t know if I just wasn’t paying attention during that part of the book, or if it wasn’t completely explained or what, but his ability to track things is all related to being the third amplifier. I did wonder if there was more to his ability when I read Smoke And Bone, and I had given up all hope that it would be explained. That explanation did come through, and I don’t know how I feel about it. I mean, it did work, and I liked how everything came full circle, and that everything really is connected. And this really is the best place for everything we learn about the Darkling and Morozova, because I think it being revealed in either of the previous books would really have given it away. I think that’s why it felt a little out of the blue and a bit forced. Or maybe I’m just really oblivious, and should have figured it out earlier. But overall, I thought it worked and that this was the best place for it all. And I’m not surprised that Mal and Alina ended up together, since he seems to really ground her. But I’ve never really liked them as a couple, because they felt too much like friends to me. It did seem like there was the possibility of Alina and the Darkling (before we realized how insane he was) and Alina and Nikolai (before he became king, which meant Alina would be his queen if they got together), and, of course, Mal. Alina really is just an ordinary girl who was able to get rid the Unsea and take down the Darkling, and because of that, it was always going to be Mal. I just wish I could have believed them as a couple, like I could have with both the Darkling and Nikolai. Then, again, this series never was about the romance. At least, I didn’t particularly care about it in this series, and I think it’s because of everything else going on. Like how balance is really important. And friends and not wanting all the power for yourself, and what happens when you seek too much power. Now that the super-spoiler-y bits are done…we can get on to the really short and non-spoilerific part of the review. One thing I’ve really loved about this series is the overall world. We learn things along the way, and what strikes me about this entire series is that it’s a fantasy series set in a world that reminded me of Russia! So many fantasy books have a pseudo-Medieval Europe setting (particularly Medieval UK) that a pseudo-Russian world is really different and makes it stand out because of how unique it is. I pictured everything so well, and I have to say that I would LOVE to see this series as movies, because the costumes and make-up and sets would be so amazing. Also: there are some characters that I’ve really come to love, and they really have come a long way from when we first met them in Shadow And Bone. I really liked Ruin & Rising! I felt like things came full-circle, and I was definitely surprised by a lot of things. Overall, it’s my favorite book in the series because of everything we learn, even if I didn’t love it the way I loved Siege And Storm. Ruin And Rising gets 4 stars. I think that Mal was supposed to be a descendent of Bhagra’s sister that Mordzova (or whatever his name was) brought back to life. I thought maybe it was supposed to be something like that, but I wasn’t sure! Makes sense!